Whether you prefer a strenuous three day hike to a remote backcountry campsite or an easy day hike through one of several stunning canyons, then this is the park for you. There are over eighty miles of trails to chose from. 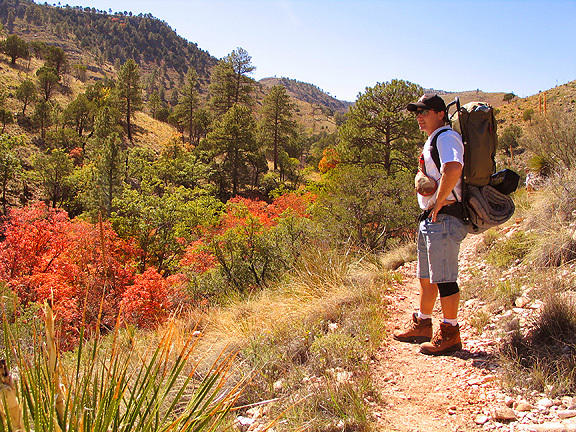 Hiking is only one of many activities you can pursue, bird and wildlife watching, stargazing, horseback riding (bring your own) and photography are just some of the activities that await you at Guadalupe Mountains. Fall is almost always spectacular. 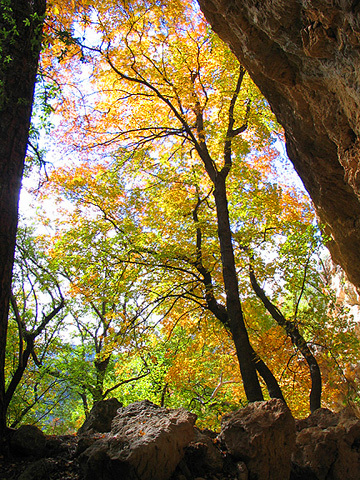 The color in McKittrick Canyon is truly amazing! There are two campsites that you can drive to. Pine Springs near the visitor center is the most convenient and popular, with twenty tent and eighteen R.V. sites. Dog Canyon is on the far north east side of the park and has nine tent and five R.V. sites. Both have restrooms and water. 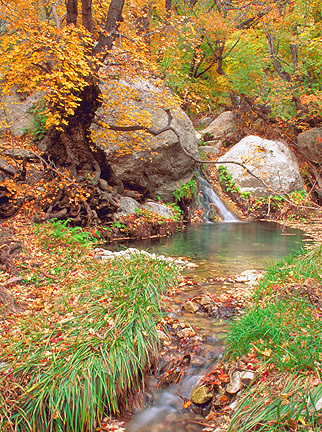 Smith Spring is a beautiful oasis tucked away in a hidden valley. A bubbling stream curves through bigtooth maples then trickles down gentle slopes. Mule Deer and other wildlife gather in the afternoon to escape the sun and drink the cold, crisp water and eat from berry laden madrone's. Smith Spring is among the highest springs in Texas and flows from the Bell Canyon sandstone at 5,955 feet above sea level. This spring water collects in the higher elevations to the northwest where rainfall is greater. The water then percolates down through a complex system of joints in the limestone and sandstone layers. 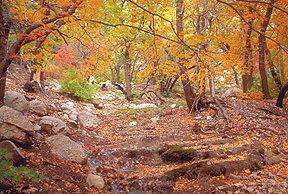 Late October to early November McKittrick Canyon transforms into a landscape of unbelievable beauty. Brilliant red, vivid yellow and bright orange set against a deep blue sky dazzle the senses. 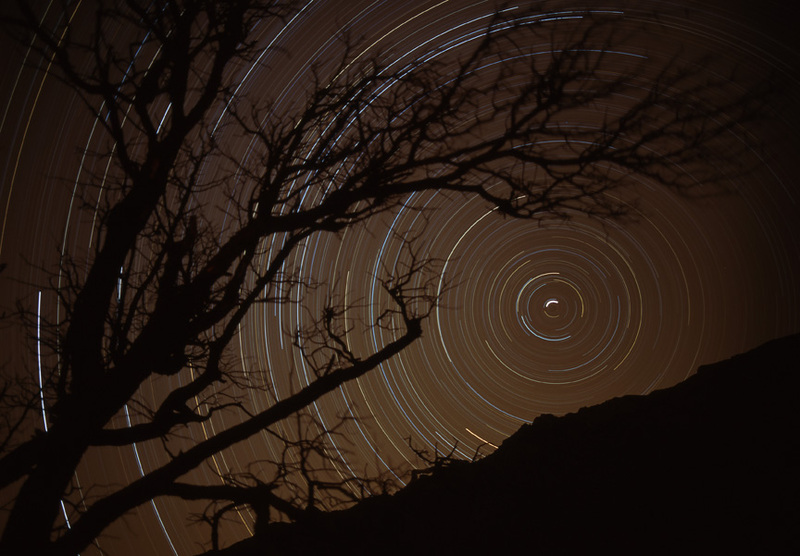 Each year thousands of visitors flock to the Guadalupe Mountains National Park to witness this stunning display. To experience the magic of McKittrick, allow 3 to 5 hours to hike into the canyon. The hike is initially along the rocky stream bed, then winds along the sandy banks at either side, crossing the creek several times. After 2.4 miles the path reaches Pratt Lodge, there you'll find an old lodge, wooden buildings and a picnic table huddled beneath shady trees. Further along the trail there's a grotto, in a cavity you'll find stalagmite-like formations hanging from a limestone cliff, a cool place to stop and rest. McKittrick Ridge, is the usual point visited on a day hike, and is 3.4 miles from the start of the trail. Ahead, the canyon becomes quite steep and the path climbs nearly 2,000 feet over the next 2 miles to McKittrick Ridge at 7,716 feet, then continues through the forest, eventually joining the long Tejas Trail 4 miles from the northern park entrance. 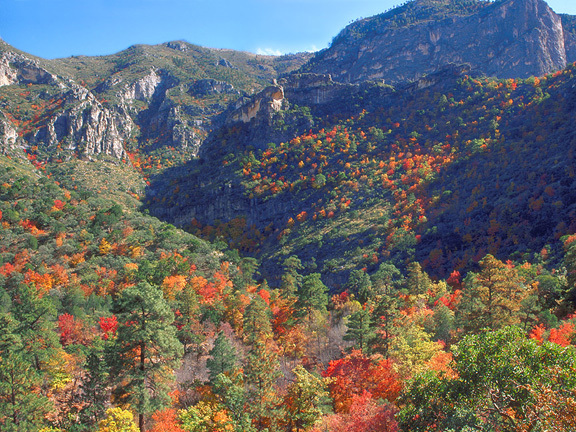 McKittrick Canyon is designated as day-use only, with visiting hours from 8:00 am - 6:00 pm late April through October (Mountain Daylight Time), and 8:00 am - 4:30 pm November through April (Mountain Standard Time). Please exit McKittrick Canyon before the posted closing time. The entrance gate at the highway turn-off is locked each evening. Headquarters Visitor Center at Pine Springs can be accessed via U.S. highway 62/180 between Carlsbad, New Mexico and El Paso, Texas. An informative 12 minute slide presentation is available on request. Visitor Center has extensive natural history exhibits on park fauna, flora, and geology and a short geology video. A variety of park brochures are also available. Headquarters Visitor Center is fully accessible; accessible rest rooms. Open All Year Staffed intermittently. The entrance road for McKittrick canyon is 7 miles east of the Park Headquarters on U.S. highway 62/180. Features outdoor exhibits and slide program on local area history, geology, and other natural resources of the canyon. 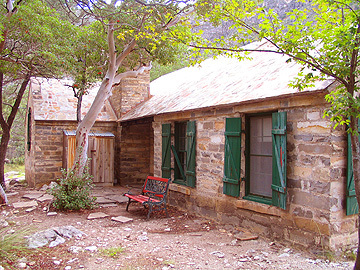 McKittrick Canyon Contact Station has handicap accessible restrooms. Located 1 mile east of the Headquarters Visitor Center off U.S. highway 62/180. Features key information and exhibits on local history. Available Facilities, Vehicle length limited to 21 feet due to small parking area. The Dog Canyon Ranger Station is located on the north side of the park and may be accessed via NM state road 137, 70 miles from Carlsbad, NM or 110 miles from Park Headquarters. You may also reach Dog Canyon by exiting U.S. highway 62/180 22 miles south of the park on Texas FM road 1576 to NM state road 137. Note: 31 miles of this route is a gravel/dirt road. Small Ranger Station where visitors may obtain backcountry permits, or information about the area. Ranger on duty but may not be at the contact station. Restroom available.